This paper discusses preservice teachers’ perceptions of an online, in-house diversity simulation in an undergraduate teacher education program conducted over a 3-year period. The diversity simulation was a nontraditional capstone experience for 193 preservice teachers in majors ranging from early childhood to secondary education. The diversity simulation included scenarios at the kindergarten, middle school, and high school levels, allowing participating preservice teachers to assume leadership positions during the simulation. Results of an anonymous survey indicated that the preservice teachers found that the diversity simulation provided realistic scenarios and promoted creative thinking and team building. Preservice teachers were also asked to write a final critique essay of the simulation experience. Qualitative themes emerged from an analysis of the essays that were consistent with previous research on simulations. Such themes included self-efficacy, emerging professional identity, empathy, leadership, knowledge base, collaboration, ethics, and critical thinking. Manburg, J., Moore, R., Griffin, D. & Seperson, M. (2017). Building Reflective Practice Through an Online Diversity Simulation in an Undergraduate Teacher Education Program. 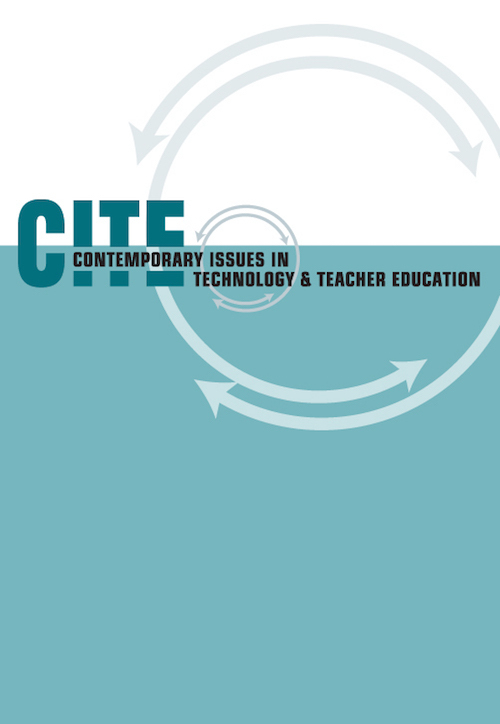 Contemporary Issues in Technology and Teacher Education, 17 (1), 128-153. Waynesville, NC USA: Society for Information Technology & Teacher Education. Retrieved April 19, 2019 from https://www.learntechlib.org/primary/p/148452/. Archambault, L., Wetzel, K., Foulger, T.S., & Williams, M.K. (2010). Professional development 2.0: Transforming teacher education pedagogy with 21st century tools. Journal of Digital Learning in Teacher Education, 27(1), 4-11. Badiee, F., & Kaufman, D. (2014). The effectiveness of an online simulation for teacher education. Journal of Technology and Teacher Education, 22(2), 167-186. Badiee, F., & Kaufman, D. (2015). Design evaluation of a simulation for teacher education. SAGE Open, 5(2), 1–10. Bachen, C., Hernandez-Ramos, P., & Raphael, C. (2012). Simulating REAL LIVES: Promoting global empathy and interest in learning through simulation games. Simulation& Gaming, 43(4), 437-460. Barab, S., & Dede, C. (2006). Games and immersive participatory simulations for science education: An emerging type of curricula. Journal of Science Education and Technology, 16(1), 1-3. Bautista, N., & Boone, W. (2015). Exploring the impact of TeachME lab virtual classroom teaching simulation on early childhood education majors’ self-efficacy beliefs. Journal of Science Teacher Education, 26(3), 237-262. Burton, E., Frazier, W., Annetta, L., Lamb, R., Cheng, R., & Chmiel, M. (2011). Modeling augmented reality games with pre-service elementary and secondary science teachers. Journal of Technology and Teacher Education, 19(3), 303-329. Chesapeake, VA: Association for the Advancement of Computing in Education. Carrington, L., Kervin, L., & Ferry, B. (2011). Enhancing the development of pre-service teacher professional identity via an online classroom simulation. Journal of Technology and Teacher Education, 19(3), 351-368. Creswell, J. (1995). Research design: Qualitative and quantitative approaches. Thousand Oaks, CA: Sage. Gibson, D. (2007). SimSchool and the conceptual assessment framework. In D. Gibson, C. Aldrich& M. Prensky (Eds.). Games and simulations in online learning. Hershey, PA: Ideas Group. Girod, M., & Girod, G. (2008). Simulation and the need for quality practice in teacher preparation. Journal of Technology and Teacher Education, 16(3), 307-337. IBM Corporation (2010). IBM SPSS Statistics for Windows, Version 19.0. Armonk, NY: Author. Inglis, S., Sammon, S., Justice, C., Cuneo, C., Miller, S., Rice, J., Roy, D., & Warry, W. (2004). Cross-cultural simulation to advance student inquiry. Simulation& Gaming, 35(4), 476-487. Kervin, L., Ferry, B. & Carrington, L. (2006). ClassSim: Preparing tomorrows teachers for classroom reality. In C. Crawford, C. Carlsen, K. McFerrin, J. Price, R. Weber& D. Willis (Eds. ), Society for Information Technology& Teacher Education Conference (pp. 32043211). Lin, L., & Zhang, T. (2011). Playing exergames in the classroom: Pre-service teachers’ motivation, passion, effort, and perspectives. Journal of Technology and Teacher Education, 19(3), 243-260. Lindgren, R., & Schwarz, D. (2009). Spatial learning and computer simulations in science. International Journal of Science Education, 31(3), 419-438. Lu, L. (2011). Art education avatars in action: Preparing art teachers for learning and teaching in a virtual age. Journal of Technology and Teacher Education. 19(3), 287-301. Mason, L., Glomb, N., & Blair, P. (2012). How virtual learning environments function to simulate IEP team meetings in a distance teacher education program. In P. Resta (Ed. ), Proceedings of Society for Information Technology& Teacher Education International Conference (pp. 630-635). Miles, M.B., & Huberman, A.M. (1994). Qualitative data analysis I (2nd ed.). Thousand Oaks, CA: Sage. Onwuegbuzie, A.J., & Leech, N.L. (2006). Linking research questions to mixed methods data analysis procedures. The Qualitative Report, 11, 474-498. Rayner, C., & Fluck, A. (2014). Pre-service teachers’ perceptions of simSchool as preparation for inclusive education: a pilot study. Asia-Pacific Journal of Teacher Education, 2014, 42(3), 212-227. Rosenbaum, E., Klopfer, E., & Perry, J. (2007). On location learning: Authentic applied science with networked augmented realities. Journal of Science Education and Technology, 16(1), 31-45. Rutten, N., van Joolingen, W., & VanderVeen, J. (2012). The learning effects of computer simulations in science education. Computers in Education, 58(1), 136-153. Schrader, P., Archambault, L., & Oh-Young, C. (2011). Training by gaming: Preparing teachers of today for tomorrow’s learning environments. Journal of Technology and Teacher Education, 19(3), 261-286. Simkins, D. & Steinkuehler, C. (2008). Critical ethical reasoning and role-play. Games and Culture. 3(3-4), 333-355. Sottile, J., & Brozik, D. (2004). The use of simulations in a teacher education program: The impact on student development. Paper presented at the 2004 Hawaii International Conference on Education, Honolulu, HI. Windschitl, M., & Andre, T. (1998). Using computer simulations to enhance conceptual change: The roles of constructivist instruction and student epistemological beliefs. Journal of Research in Science Teaching, 35, 145-160. Yukhymenko, M. (2011). Students’ interest in social studies and negotiation self-efficacy: A meta-analysis of the GlobalEd Project. Journal of Technology and Teacher Education, 19(3), 369-392.